"Not just for the Young 'Uns..."
Basically, what you’re trying to do when “fishing the Method” is to create a very competitive feeding situation for the Carp in your swim. You’ll often hear the term “pre-occupation,” this is just one in the same thing really. The Carp are so busy competing for the morsels of food you’re presenting that they tend to make mistakes and get themselves hooked… if that is, your end rig is doing its job. So, that begs the question, how do we get them into this frenzied state and force them to make an error? Obviously first you must be fishing in a swim/peg that is likely to contain underwater features that Carp favor frequenting and feeding on. There is no use in fishing even the best techniques in an area where the Carp don’t feed. How we find where the Carp like to feed is a whole other 'complex issue' that we will discuss in another section of the website. “The Method” involves molding a paste or pack bait around a purpose-built cage on your hook length. Note: A sturdy rod is needed to cast a fully loaded Method Cage out, it could weigh around 5 or 6 oz.! A 2.75lb test curve rod is recommended as a minimum. To start with, soak a wild birdseed food in Salty water for at least 24 hours, 36 hours is preferred so plan ahead. You can find the birdseed in most large grocery stores in the pet-food section. Use two tablespoons of salt (non-Iodine salt if possible) per 5 gallon bucket of water, some folks use even more but we encourage you to experiment yourself to find a level you’re comfortable with. Note: Try not to use water from your Kitchen faucet, as it’s more than likely going to be chlorinated and/or have fluoride in it. Use rain or lake water. Try taking a few buckets of lake water home to use if you know another session is on the cards soon. Or, if you do use Tap water, let it sit outside in a bucket under the full sun for a few days to remove the Chlorine. If you also use hemp or any of the larger particles in your mix such as Maize, Garbanzo or any other kind of Beans, please make sure they have also been boiled at a vigorous boil for at least 30 minutes in addition to their 24-36-hour soak. This boiling process has the added benefit of releasing all the natural sugars and amino acids that are present in the seed, which is great news because they are the major attractors and feeding triggers for the Carp. If in any doubt do both the soak and boil to make sure of the fish’s safety! Note: Please don’t skimp on the time here because you need the seed to be thoroughly soaked and expanded before presenting it to the fish, otherwise you are feeding the fish with seeds that may seriously harm them!!! When dry seeds of any kind are soaked (re-hydrated) they expand in size by somewhere around 20+% of their original dry size. You don’t want any fish with a gut full of semi soaked seeds for obvious reasons. Here are some examples of flavor and attractants that are typically present in many Carp angler's bait fridge. Bread Crumbs are often used to bind the mix and hold it onto the cage, this ingredient is again obtainable from the grocery store or you can make your own by drying out sliced bread in the sun or in the oven on a low heat and then crunching into crumbs. Other binders commonly used in place of or in combination with Bread Crumbs are Layers Chicken Mash, Soy Meal, and Panko among many others. Place the amount of soaked seed you need into a bowl with a little of the water they were soaking in and then start adding the bread crumb. Add the breadcrumb and mix thoroughly. At this stage, you can add any other ingredients you want to try such as sweetcorn, fishmeal, CSL/pakka/hemp pellets, betaine, cold pressed hemp oil etc. and it’s a big “etc.” But we advise to keep it simple at first. Keep adding the bread crumb slowly while you’re mixing, if you need more water add very carefully a few drops at a time while mixing. You want to end up with a consistency that will mold well around the cage and stay together during your cast but not take any more than about 5 to 10 minutes to totally breakdown and fall off your cage once its hit the bottom of the lake. You can test your mix's break down rate in the margins just in front of your rods to see how long it takes to completely break down. Now we’ve got the mix together let’s look at the business end of the rig and how to present your hook bait. The section below shows the typical component parts of the Method rig. Method cages come in various designs and sizes from 1oz up to 3oz are common, the one shown above is typical in design. We like the heaviest version available (2 to 3 oz.) so that the feeder cage acts as a bolt rig lead. This is where the weight and bulk of the feeder cage sets the hook as the Carp “bolts off” after picking up the bait. Choose your hook (size 6’s & 4’s work for well) and tie the hook length material you’ve chosen using the knotless knot with a hair. Alternatively, if you’re not a “hair fan,” no problem, just tie the hook with your usual knot and side hook the bait making sure the point of the hook is showing. Tie the other end of the hook length to a size 8 swivel. As shown below, thread an 18 to 24” length of Rig Tubing onto the end of your mainline to stop the line getting behind the Carp’s scales and pulling them off during the fight. This also gives the line a lot of added abrasion resistance when fishing rocky or snaggy areas. 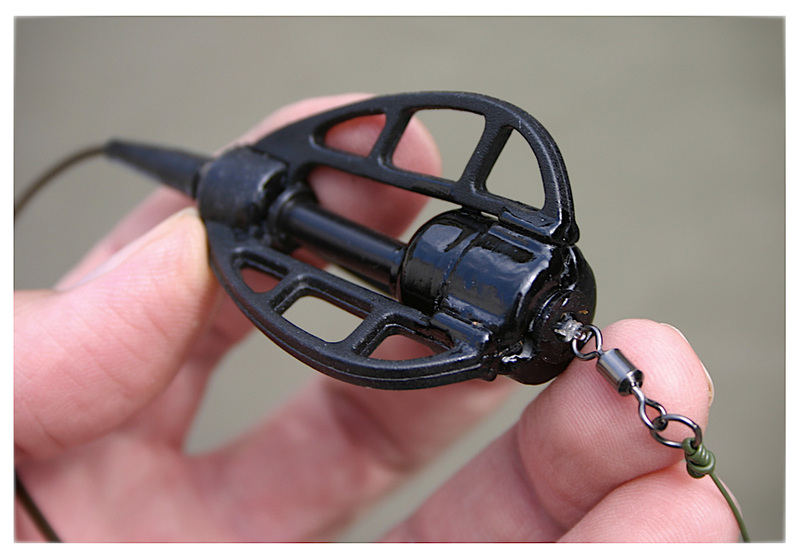 Next, take the method cage and thread it onto your mainline as shown pushing the rig tubing into the rubber tail at the top of the Method cage, dab with a spot of super glue at the joint where the rig tubing pushes into the tail rubber at the top of the method cage to secure and then tie the mainline to your hook length via the swivel. Now gently push the swivel home into the soft rubber grommet at the base of the cage. Almost all method cages have the soft rubber grommets in their base for this purpose. Same thing for the newer method weights that are on the market now. Note: Regardless of how you rig up the method cage make sure that it is semi-fixed to your mainline. That is: If you break off after hooking-up and the fish is swimming around, hook in its mouth with the method cage trailing behind it, make sure that the method cage is rigged as above and can easily pull free of the broken line when it gets caught up or snagged on under water structure. This will ensure that the fish doesn’t get tethered to the snag and die a slow death. Next, as the next 3 photos show, pack the mix quite tightly around your Method cage and bait the hair with the bait of your choice and cast out to your chosen feature. Load one side of the cage up heavier than the other and pin the hook in the mix on the lighter side, this ensures two things: Firstly, that your rig doesn’t tangle during the cast and secondly that the hook bait always ends up on top of the cage facing the surface of the water and the fish when it lands on the bottom of the lake. 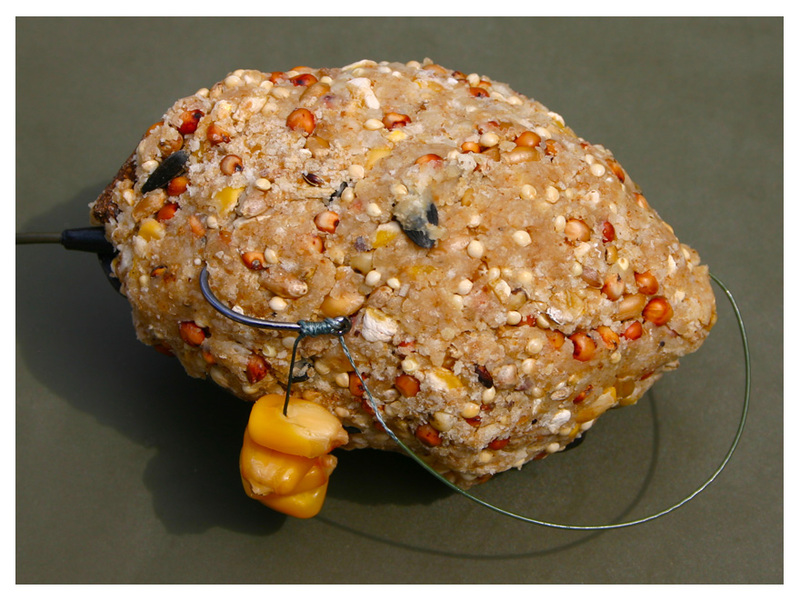 It's also a great idea to attach a PVA nugget onto the baited hook, then cast out to your chosen spot. After a couple of minutes, the PVA nugget will rise to the surface to give you the exact location of your bait. When this happens, if it's legal in your state to chum be ready to catapult or spoon up to 10 balls of the method mix out to the spot where the PVA nugget hit the surface to get things started. Then recast your hook bait with a reloaded method cage to the same spot every 10/20 minutes for the first hour or until you have the fish in front of you feeding. After you start getting bites with a few fish in the net and feel the Carp are feeding and “elbowing” each other out of the way to get at your bait, reduce the method mix going in and occasionally spod/spoon/catapult some of the soaked birdseed you kept back earlier out into the swim to keep the Carp busy routing around in your swim for the small particles and seed. The trick at this stage is to just put enough food in to keep them competitively looking for food and in front of you but not to fill them up. Until you get used to fishing this way we suggest literally sitting on your hands while waiting for a “screaming run” because you tend to get a lot of knocks, nudges and beeps on the alarms when the fish are bumping the method mix off the cage to eat it. Wait for the one tone scream of the alarm denoting a "full-on" run before you are tempted to lift your rod in to the fish, although technically, the weight of the method cage acts as a bolt rig and hooks the fish for you as the fish “bolts” in a panic. We wish you much luck, have fun!